Binge-watching’s something that I don’t do often. Maybe it’s the total number of TV shows I sit down and watch having dwindled over the years. Perhaps it’s the shows I tend to watch—sports, news, cartoons, or the TV as background noise. Or maybe it’s wondering where people find time or patience to sit through an entire season’s worth of an hour-long TV show all at once. There’s also the sheer number of episodes I’d have to watch to even begin to catch up on certain TV shows. Still, it’s a trend that’s definitely popular. The infographic below (based on a YouGov survey) lists the viewing preferences of several age demographics. 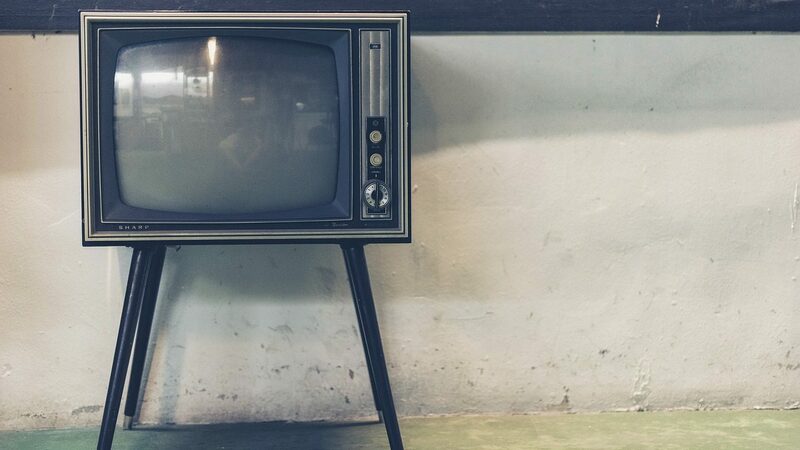 Overall, Americans now favor binge-watching over weekly episodes. Despite the survey’s fairly small size (slightly fewer than 1,000 adults), it does give some interesting results. Unsurprisingly, the biggest binge-viewers are millennials, with 68% of them favoring getting episodes all at once. Those between 35 and 54 (Gen X) also prefer to binge. 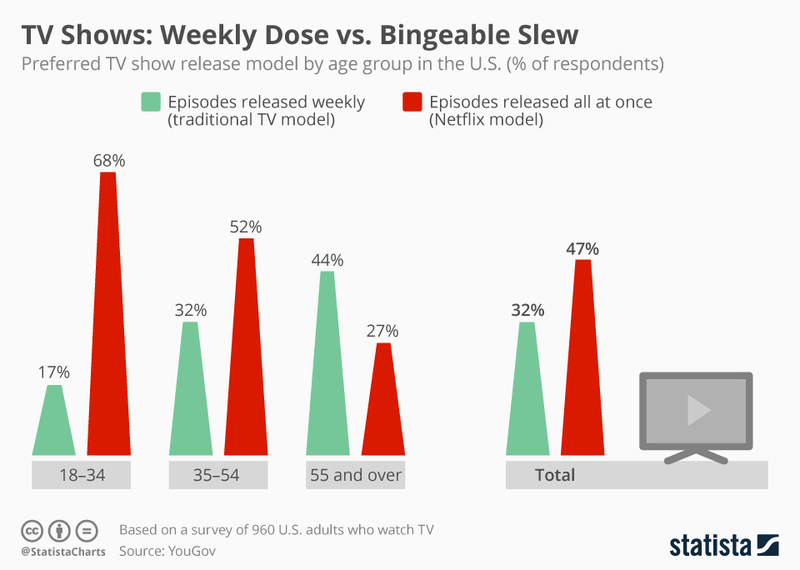 It’s those over 55 (Baby Boomers) that prefer the traditional weekly TV model. Overall, binge-viewing wins out over weekly installments. One can watch the entire season of a show at once, and at one’s own pace. A show can offer stronger continuity and more complex storylines, versus resolving everything within 60 minutes. Possibly less assumption that “viewers are morons” (to quote TV Tropes), so there’s less assumption that the viewers don’t have an attention span. Avoiding spoilers if one hasn’t finished watching the season. As I said earlier, finding time to plow through a sizable number of episodes, especially for hour-long shows. Obviously, binge-viewing isn’t going away anytime soon. Netflix plans to spend $8 billion on producing original content in 2018. Amazon also plans on stepping up their original programming production. Part of this is to follow the “HBO” model of owning and producing their own original programming. This lets Netflix and company rely less on paying an ever-increasing amount for programs and movies from traditional media outlets. Said traditional media outlets are also trying to get into streaming, but are still stuck on their traditional ways. As an example, CBS offers “Star Trek: Discovery” on their own streaming service. However, the show’s appearing on CBS All Access like a show on CBS-proper: weekly episode releases from September through November, with a mid-season break before returning in January. Though I assume there’s nothing stopping someone from just subscribing for a month, binge-watching the whole season, then cancelling. Of course, that’d defeat the purpose of CBS relying on “Trek” nostalgia to prop up a streaming service few seem to want otherwise. But again, paying for an excessive number of streaming services is infeasible anyway, not to mention a bad idea. How do you feel about binge-watching? WordPress.com or WordPress.org: which version to choose? The best live streaming video services for cartoons? Binge watching works best for me during long drives, like going out of town to visit family. Or during any other, vacation-like, down times. It’s quite fun then. But impossible to swing during normal times of the year when my TV viewing is low.